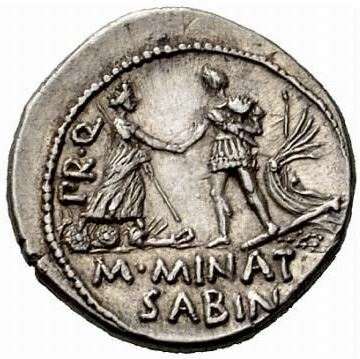 M. Minatius Sabinus was Proquaestor in 46-45 BC, and struck coins jointly with Pompeius Magnus in that respect. Gens Minatia was a minor plebeian family at Rome. The gens was probably of Sabine origin, as its nomen is derived from the Oscan praenomen Minatus, and the first of the family to appear in Roman history bore the surname Sabinus.